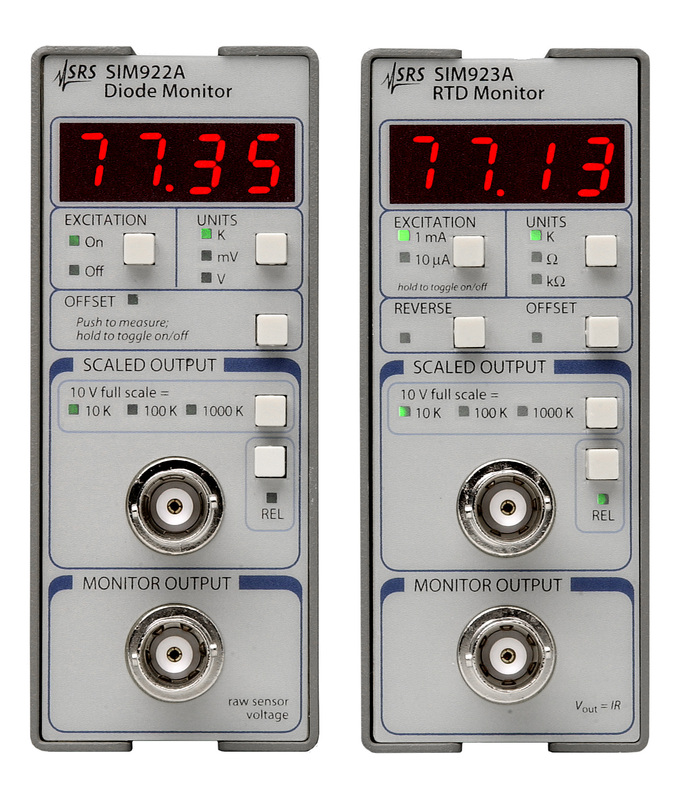 The SIM922A Diode Monitor and the SIM923A RTD Monitor continuously read a single sensor and provide both digital and analog outputs. Based on the modular SIM platform, they provide high performance capability in a small footprint. The SIM922A has a programmable, precision 10 µA current source to provide sensor excitation. Results can be displayed in either kelvins or volts. 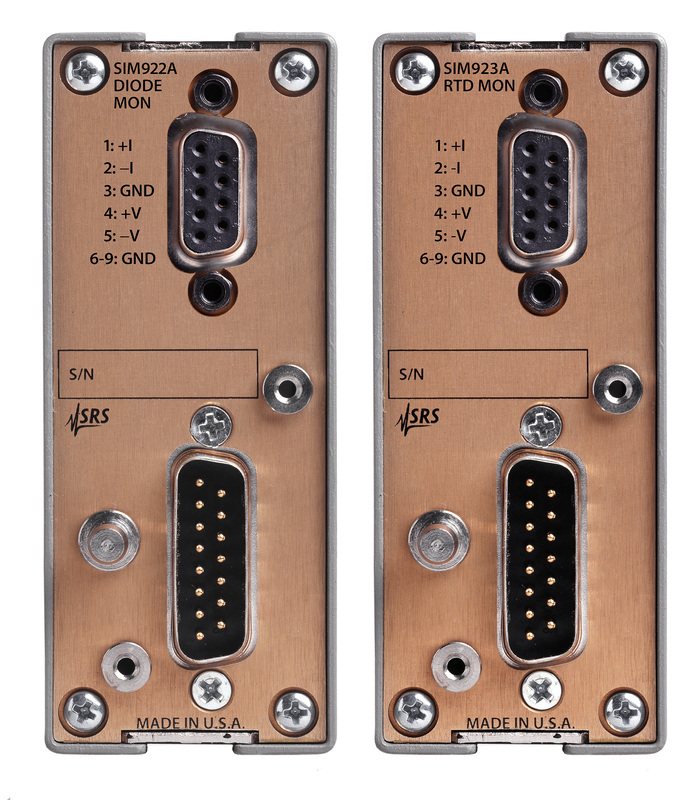 The SIM923A has selectable 10 µA and 1 mA current sources to provide sensor excitation. Sensor resistance is determined ratiometrically with a half-bridge circuit consisting of the sensor and an internal reference resistor. The current to the sensor can be reversed by the user to test for any offset. Measurement results can be displayed in either kelvins or ohms. Both the SIM922A and SIM923A employ four-wire measurement circuits (±I excitation leads, ±V sense leads), making readings insensitive to series lead resistance. Sensor excitations can be disabled to reduce power dissipation at sensitive cryogenic stages. Measurements are performed at five readings per second. The scaled analog output (±10 V) produces a voltage proportional to measured temperature, with a full-scale range from 10 K to 1000 K. A relative-mode button subtracts the last absolute reading prior to scaling, to provide expanded resolution for temperature deviations. The second (monitor) output is the buffered, low-noise raw sensor voltage without any additional processing. Either analog output may be coupled to the SIM960 Analog PID Controller for high-performance, closed-loop temperature control. A factory-standard calibration curve is pre-programmed for each model. Non-volatile memory also permits storage of a 256-point custom calibration curve to convert sensor units (V or Ω) to temperature units (K). Results are displayed on an easy-to-read, 4-digit LED display. Full remote operation is available over the serial interface.